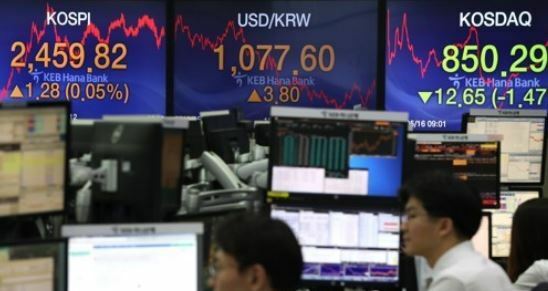 South Korea's 30 richest stockholders have lost more than 10 trillion won ($8.81 billion) combined in the value of their shares this year amid a bearish equities market, data showed Sunday. As of last Wednesday, the aggregated value of shares owned by the top 30 stockholders stood at 77.69 trillion won, down 11.84 percent from the end of last year, according to the local financial information provider FnGuide Inc. The benchmark KOSPI has lost 7.19 percent this year, dropping to 2,290.11. On the first trading session of this year, the index closed at 2,479.65. Samsung Group Chairman Lee Kun-hee suffered the largest loss, with the value of his shares plunging 12.33 percent, or 2.3 trillion won, to 16.3 trillion won, according to the data. The business tycoon has been hospitalized since May 2014 after suffering a heart attack. Suh Kyung-bae, head of South Korea's leading cosmetics firm AmorePacific Group, came next by losing 1.9 trillion won, or 22.49 percent, of his stock value. The share value of Lim Sung-ki, who leads the local pharmaceutical firm Hanmi Science Co., also has dropped 37.79 percent, or 900 billion won, so far this year to 1.5 trillion won, the data showed.